Tedd Epp Re/Max Saskatoon 306-221-1614 Service with a smile! 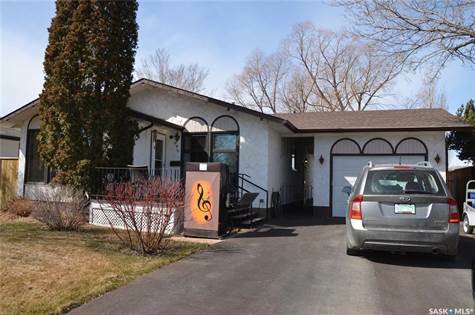 Garage: "Garage: 1 Car Detached; Parking Space(s): 6"
Lot Size: 55ft x 100ft "Rectangular"
This spacious bungalow is large for the area at 1272 square feet. When you enter the home you are in a large living room with lots of light. French doors lead to the dining room and Kitchen. The bedrooms are quite large and there is a 2 piece bath off the master bedroom. The main floor windows have been upgraded as well as the furnace, front door, shingles and fence over the last several years. The driveway has been rubber paved and can hold at least six cars. The single garage is over sized with 10 foot ceilings. The is a breezeway between house and garage for shelter. The basement has a lot of space for entertaining or guests. The utility room is very large for crafts or projects. This home has been very well maintained with a long list of repairs and upgrades.